●Takatsuki H*, Agbemabiese CA, Nakagomi T, Pun SB, Gauchan P, Muto H, Masumoto H, Atarashi R, Nakagomi O, Pandey BD. : Whole genome characterisation of G11P and G9P rotavirus A strains from adult patients with diarrhoea in Nepal. Infect Genet Evol, 69:246-254, 2019. ●Ishibashi D*, Homma T, Nakagaki T, FuseT, Sano K, Satoh K, Mori T, Atarashi R and Nishida N.: Type I interferon protects neurons from prions in in vivo models. Brain, 2019 Feb 7. doi: 10.1093/brain/awz016. ●Miyazaki Y, Ishikawa T, Kamatari YO, Nakagaki T, Takatsuki H, Ishibashi D, Kuwata K, Nishida N, Atarashi R*: Identification of alprenolol hydrochloride as an anti-prion compound using surface plasmon resonance imaging. Mol Neurobio, 2018 Apr 27. doi: 10.1007/s12035-018-1088-7. ●Sano K*, Atarashi R, Satoh K, Ishibashi D, Nakagaki T, Iwasaki Y, Yoshida M, Murayama S, Mishima K, Nishida N.: Prion-Like Seeding of Misfolded α-Synuclein in the Brains of Dementia with Lewy Body Patients in RT-QUIC. Mol Neurobio, 55(5): 3916-3930. ●Kawasaki M, Fuchigami T*, Kobashi N, Nakagaki T, Sano K, Atarashi R, Yoshida S, Haratake M, Nishida N, Nakayama M*: Development of radioiodinated acridine derivatives for in vivo imaging of prion deposits in the brain. Bioorg Med Chem, 25(3):1085-1093. ●Wang F, Wang X, Orru CD, Groveman BR, Surewicz K, Abskharon R, Imamura M, Yokoyama T, Kim YS, Vander Stel KJ, Sinniah K, Priola SA, Surewicz WK, Caughey B, Ma J*: Self-propagating, protease-resistant, recombinant prion protein conformers with or without in vivo pathogenicity. PLoS Pathog, 13(7):e1006491. ●Okada H*, Iwamaru Y, Imamura M, Miyazawa K, Matsuura Y, Masujin K, Murayama Y, Yokoyama T: Oral transmission of L-Type bovine spongiform encephalopathy agent among cattle. Emerg Infect Dis, 23(2):284-287. ●Okada H, Masujin K, Miyazawa K, Iwamaru Y, Imamura M, Matsuura Y, Arai S, Fukuda S, Murayama Y, Yokoyama T: Experimental infection of cattle with a novel prion derived from atypical H-type bovine spongiform encephalopathy. Vet Pathol, 2017 Jan 1:300985817717769. ●Imamura M, Miyazawa K*, Iwamaru Y, Matsuura Y, Yokoyama T, Okada H*: Identification of the first case of atypical scrapie in Japan. J Vet Med Sci, 78(12):1915-1919. ●Imamura M*, Kato N, Iwamaru Y, Mohri S, Yokoyama T, Murayama Y: Multiple affinity purification of a baculovirus-derived recombinant prion protein with in vitro ability to convert to its pathogenic form. Prep Biochem Biotech, 47(1):1-7. ●Satoh K*, Atarashi R, Nishida N: Real-time quaking-induced conversion for diagnosis of prion disease. Methods Mol Biol. 1658:305-310. ●Schmitz M*, Cramm M, Llorens F, Muller-Cramm D, Collins S, Atarashi R, Satoh K, Orru CD, Groveman BR, Zafar S, Schulz-Schaeffer WJ, Caughey B, Zerr I.: The real-time quaking-induced conversion assay for detection of human prion disease and study of other protein misfolding diseases. Nat Protoc, 11(11):2233-2242. ●Takatsuki H, Fuse T, Nakagaki T, Mori T, Mihara B, Takao M, Iwasaki Y, Yoshida M, Murayama S, Atarashi R, Nishida N, Satoh K*: Prion-seeding activity is widely distributed in tissues of sporadic Creutzfeldt-Jakob disease patients. EBioMedicine, 12:150-155. ●Ishibashi D*, Nakagaki T, Ishikawa T, Atarashi R, Watanabe K, Cruz FA, Hamada T, Nishida N.: Structure-based drug discovery for prion disease using a novel binding simulation. EBioMedicine, 9:238-249. ●McGuire LI, Poleggi A, Poggiolini I, Suardi S, Grznarova K, Shi S, de Vil B, Sarros S, Satoh K, Cheng K, Cramm M, Fairfoul G, Schmitz M, Zerr I, Cras P, Equestre M, Tagliavini F, Atarashi R, Knox D, Collins S, Haik S, Parchi P, Pocchiari M, Green A*: Cerebrospinal fluid real-time quaking-induced conversion is a robust and reliable test for sporadic Creutzfeldt-Jakob disease: An international study. Ann Neurol, 80(1):160-165. ●Mori T*, Atarashi R, Furukawa K, Takatsuki H, Satoh K, Sano K, Nakagaki T, Ishibashi D, Ichimiya K, Hamada M, Nakayama T, Nishida N.: A direct assessment of human prion adhered to steel wire using real-time quaking-induced conversion. Sci Rep, 6:24993. ●Klionsky DJ, Abdelmohsen K, Atarashi R, Zughaier SM, et al（2,469名, 78番目）: Guidelines for the use and interpretation of assays for monitoring autophagy (3rd edition). Autophagy, 12(1): 1-222. ●Imamura M*, Tabeta N, Kato N, Matsuura Y, Iwamaru Y, Yokoyama T, Murayama Y: Heparan sulfate and heparin promote faithful prion replication in vitro by binding to normal and abnormal prion proteins in protein misfolding cyclic amplification. J Biol Chem, 291(51):26478-26486. ●Okada H*, Miyazawa K, Imamura M, Iwamaru Y, Masujin K, Matsuura Y, Yokoyama T: Transmission of atypical scrapie to homozygous ARQ sheep. J Vet Med Sci, 78(10):1619-1624. ●Masujin K, Okada H, Miyazawa K, Matsuura Y, Imamura M, Iwamaru Y, Murayama Y, Yokoyama T*: Emergence of a novel bovine spongiform encephalopathy (BSE) prion from an atypical H-type BSE. Sci Rep, 6:22753. ●Iwamaru Y*, Kitani Y, Okada H, Takenouchi T, Shimizu Y, Imamura M, Miyazawa K, Murayama Y, Hoover EA, Yokoyama T: Proximity of SCG10 and prion protein in membrane rafts. J Neurochem, 136:1204-1218. ●Nakano Y, Akamatsu N, Mori T*, Sano K, Satoh K, Nagayasu T, Miyoshi Y, Sugio T, Sakai H, Sakae E, Ichimiya K, Hamada M, Nakayama T, Fujita Y, Yanagihara K, Nishida N: Sequential washing with electrolyzed alkaline and acidic water effectively removes pathogens from metal surfaces. PLoS One, 11(5):e0156058. ●Fuchigami T*, Yamashita Y, Kawasaki M, Ogawa A, Haratake M, Atarashi R, Sano K, Nakagaki T, Ubagai K, Ono M, Yoshida S, Nishida N, Nakayama M*: Characterisation of radioiodinated flavonoid derivatives for SPECT imaging of cerebral prion deposits. Sci Rep, 25: 18440. ●Ishibashi D*, Homma T, Nakagaki T, Fuse T, Sano K, Takatsuki H, Atarashi R, Nishida N: Strain-dependent effect of macroautophagy on abnormally folded prion protein degradation in infected neuronal cells. PLoS One, 10(9):e0137958. ●Sano K, Atarashi R*, Nishida N: Structural conservation of prion strain specificities in recombinant prion protein fibrils in real-time quaking-induced conversion. Prion, 9(4):237-243. ●Takatsuki H, Satoh K*, Sano K, Fuse T, Nakagaki T, Mori T, Ishibashi D, Mihara B, Takao M, Iwasaki Y, Yoshida M, Atarashi R, Nishida N: Rapid and quantitative assay of amyloid-seeding activity in human brains affected with prion diseases. PLoS One, 10(6):e0126930. ●Homma T, Ishibashi D*, Nakagaki T, Fuse T, Mori T, Satoh K, Atarashi R, Nishida N: Ubiquitin-specific protease 14 modulates degradation of cellular prion protein. Sci Rep, 5:11028. ●Akasaka K*, Maeno A, Murayama T, Tachibana H, Fujita Y, Yamanaka H, Nishida N, Atarashi R: Pressure-assisted dissociation and degradation of "proteinas K-resistant" fibrils prepared by seeding with scrapie-infected hamster prion protein. Prion, 8(4):314-318. ●Homma T, Ishibashi D*, Nakagaki T, Fuse T, Sano K, Satoh K, Atarashi R, Nishida N: Persistent prion infection disturbs the function of Oct-1, resulting in the down-regulation of murine interferon regulatory factor-3. Sci Rep, 4:6006. ●Sano K, Atarashi R*, Ishibashi D, Nakagaki T, Satoh K, Nishida N: Conformational properties of prion strains can be transmitted to recombinant prion protein fibrils in real-time quaking-induced conversion. J Virol, 88(20):11791-11801. ●Qina T, Sanjo N*, Hizume M, Higuma M, Tomita M, Atarashi R, Satoh K, Nozaki I, Hamaguchi T, Nakamura Y, Kobayashi A, Kitamoto T, Murayama S, Murai H, Yamada M, Mizusawa H: Clinical features of genetic Creutzfeldt-Jakob disease with V180I mutation in the prion protein gene. BMJ Open, 4(5):e004968. ●Homma T, Ishibashi D*, Nakagaki T, Satoh K, Sano K, Atarashi R, Nishida N: Increased expression of p62/SQSTM1 in prion diseases and its association with pathogenic prion protein. Sci Rep, 4:4504. ●Murayama Y*, Masujin K, Imamura M, Ono F, Shibata H, Tobiume M, Yamamura T, Shimozaki N, Terao K, Yamakawa Y, Sata T: Ultrasensitive detection of PrP(Sc) in the cerebrospinal fluid and blood of macaques infected with bovine spongiform encephalopathy prion. J Gen Virol, 95(Pt 11):2576-2588. ●Okada H*, Miyazawa K, Fukuda S, Iwamaru Y, Imamura M, Masujin K, Matsuura Y, Fujii T, Fujii K, Kageyama S, Yoshioka M, Murayama Y, Yokoyama T: The presence of disease-associated prion protein in skeletal muscle of cattle infected with classical bovine spongiform encephalopathy. J Vet Med Sci, 76(1):103-107. ●Uchiyama K, Miyata H, Yano M, Yamaguchi Y, Imamura M, Muramatsu N, Das NR, Chida J, Hara H, Sakaguchi S*: Mouse-hamster chimeric prion protein (PrP) devoid of N-terminal residues 23-88 restores susceptibility to 22L prions, but not to RML prions in PrP-knockout mice. PLoS One, 9(10):e109737. ●西田教行、高月英恵：6.6章　プリオン, 病原微生物学　基礎と臨床, 荒川宜親, 神谷茂, 柳雄介（編）, 東京化学同人, pp.205-208. ●Nakagaki T, Satoh K, Ishibashi D, Fuse T, Sano K, Kamatari YO, Kuwata K, Shigematsu K, Iwamaru Y, Takenouchi T, Kitani H, Nishida N, Atarashi R*: FK506 reduces abnormal prion protein through the activation of autolysosomal degradation and prolongs survival in prion-infected mice. Autophagy, 9(9):1386-1394. ●Kishimoto Y, Hirono M, Atarashi R, Sakaguchi S, Yoshioka T, Katamine S, Kirino Y*: Age-dependent impairment of eyeblink conditioning in prion protein-deficient mice. PLoS One, 8(4):e60627. ●Sano K, Satoh K*, Atarashi R, Takashima H, Iwasaki Y, Yoshida M, Sanjo N, Murai H, Mizusawa H, Schmitz M, Zerr I, Kim YS, Nishida N: Early detection of abnormal prion protein in genetic human prion diseases now possible using real-time QUIC assay. PLoS One, 8(1):e54915. ●Imamura M, Kato N, Okada H, Yoshioka M, Iwamaru Y, Shimizu Y, Mohri S, Yokoyama T, Murayama Y*: Insect cell-derived cofactors become fully functional after Proteinase K and heat treatment for high-fidelity amplification of glycosylphosphatidylinositol-anchored recombinant scrapie and BSE prion proteins. PLoS One, 8(12):e82538. ●Kasai K, Iwamaru Y, Masujin K, Imamura M, Mohri S, Yokoyama T*: Heterogeneity of the abnormal prion protein (PrPSc) of the Chandler scrapie strain. Pathogens, 2(1):92-104. ●Ushiki-Kaku Y, Iwamaru Y, Masujin K, Imamura M, Itohara S, Ogawa-Goto K, Hattori S, Yokoyama T*: Different antigenicities of the N-terminal region of cellular and scrapie prion proteins. Microbiol Immunol, 57(11):792-796. ●Matsuura Y, Iwamaru Y, Masujin K, Imamura M, Mohri S, Yokoyama T, Okada H*: Distribution of abnormal prion protein in a sheep affected with L-type bovine spongiform encephalopathy. J Comp Pathol, 149(1):113-118. ●Iwamaru Y, Takenouchi T, Imamura M, Shimizu Y, Miyazawa K, Mohri S, Yokoyama T, Kitani H*: Prion replication elicits cytopathic changes in differentiated neurosphere cultures. J Virol, 87(15):8745-8755. ●佐藤克也, 新竜一郎, 西田教行：髄液検査のポイントと鑑別診断. Clinical Neuroscience, 31(9):1080-1082. ●佐藤克也, 新竜一郎, 西田教行：髄液14－3－3蛋白とタウ蛋白増加の鑑別診断. Clinical Neuroscience, 31(7):850-851. ●Nakato G, Hase K, Suzuki M, Kimura M, Ato M, Hanazato M, Tobiume M, Horiuchi M, Atarashi R, Nishida N, Watarai M, Imaoka K, Ohno H*: Cutting Edge: Brucella abortus exploits a cellular prion protein on intestinal M cells as an invasive receptor. J Immunol, 189(4):1540-1544. ●Ishibashi D*, Atarashi R, Fuse T, Nakagaki T, Yamaguchi N, Satoh K, Honda K, Nishida N: Protective role of interferon regulatory factor 3-mediated signaling against prion infection. J Virol, 86(9):4947-4955. ●Fujita K*, Harada M, Sasaki M, Yuasa T, Sakai K, Hamaguchi T, Sanjo N,Shiga Y, Satoh K, Atarashi R, Shirabe S, Nagata K, Maeda T, Murayama S,Izumi Y, Kaji R, Yamada M, Mizusawa H: Multicentre multiobserver study of diffusion-weighted and fluid-attenuated inversion recovery MRI for the diagnosis of sporadic Creutzfeldt-Jakob disease: a reliability and agreement study. BMJ Open, 2(1):e000649. ●Okada H*, Murayama Y, Shimozaki N, Yoshioka M, Masujin K, Imamura M, Iwamaru Y, Matsuura Y, Miyazawa K, Fukuda S, Yokoyama T, Mohri S: Prion in saliva of bovine spongiform encephalopathy-infected cattle. Emerg Infect Dis, 18(12):2091-2092. ●Takenouchi T, Iwamaru Y, Imamura M, Fukuhara S, Sugama S, Sato M, Mochizuki N, Hashimoto M, Yokoyama T, Mohri S, Kitani H*: Cytochalasin D enhances the accumulation of a protease-resistant form of prion protein in ScN2a cells: involvement of PI3 kinase/Akt signalling pathway. Cell Biol Int, 36(12):1223-1231. ●Iwamaru Y, Takenouchi T, Murayama Y, Okada H, Imamura M, Shimizu Y, Hashimoto M, Mohri S, Yokoyama T, Kitani H*: Anti-prion activity of Brilliant Blue G. PLoS One, 7(5):e37896. ●Murayama Y*, Imamura M, Masujin K, Shimozaki N, Yoshioka M, Mohri S, Yokoyama T: Ultrasensitive detection of scrapie prion protein derived from ARQ and AHQ homozygote sheep by interspecies in vitro amplification. Microbiol Immunol, 56(8):541-547. ●Fukuda S, Onoe S, Nikaido S, Fujii K, Kageyama S, Iwamaru Y, Imamura M, Masujin K, Matsuura Y, Shimizu Y, Kasai K, Yoshioka M, Murayama Y, Mohri S, Yokoyama T, Okada H*: Neuroanatomical distribution of disease-associated prion protein in experimental bovine spongiform encephalopathy in cattle after intracerebral inoculation. Jpn J Infect Dis, 65(1):37-44. ●Yamaguchi Y, Miyata H, Uchiyama K, Ootsuyama A, Inubushi S, Mori T, Muramatsu N, Katamine S, Sakaguchi S*: Biological and biochemical characterization of mice expressing prion protein devoid of the octapeptide repeat region after infection with prions. PLoS One, 7(8):e43540. ●Ishibashi D*, Atarashi R, Nishida N: Protective role of MyD88-independent innate immune responses against prion infection. Prion, 6(5):443-446. ●Matsui Y, Satoh K*, Miyazaki T, Shirabe S, Atarashi R, Mutsukura K, Satoh A, Kataoka Y, Nishida N: High sensitivity of an ELISA kit for detection of the gamma-isoform of 14-3-3 proteins: usefulness in laboratory diagnosis of human prion disease. BMC Neurol, 11:120. ●Atarashi R*, Satoh K, Sano K, Fuse T, Yamaguchi N, Ishibashi D, Matsubara T, Nakagaki T, Yamanaka H, Shirabe S, Yamada M, Mizusawa H, Kitamoto T, Klug G, McGlade A, Collins SJ, Nishida N: Ultrasensitive human prion detection in cerebrospinal fluid by real-time quaking-induced conversion. Nat Med, 17(2):175-178. ●Okada H*, Iwamaru Y, Imamura M, Masujin K, Matsuura Y, Shimizu Y, Kasai K, Takata M, Fukuda S, Nikaido S, Fujii K, Onoe S, Mohri S, Yokoyama T: Neuroanatomical distribution of disease-associated prion protein in cases of bovine spongiform encephalopathy detected by fallen stock surveillance in Japan. J Vet Med Sci, 73(11):1465-1471. ●Okada H*, Iwamaru Y, Imamura M, Masujin K, Matsuura Y, Shimizu Y, Kasai K, Mohri S, Yokoyama T, Czub S: Experimental H-type bovine spongiform encephalopathy characterized by plaques and glial- and stellate-type prion protein deposits. Vet Res, 42:79. ●Imamura M*, Kato N, Okada H, Iwamaru Y, Shimizu Y, Mohri S, Yokoyama T: Strain-specific effects of reducing agents on the cell-free conversion of recombinant prion protein into a protease-resistant form. Microbiol Immunol, 55(9):633-640. ●Shu Y, Masujin K, Okada H, Iwamaru Y, Imamura M, Matsuura Y, Mohri S, Yokoyama T*: Characterization of Syrian hamster adapted prions derived from L-type and C-type bovine spongiform encephalopathies. Prion, 5(2):103-108. ●Yoshioka M, Imamura M, Okada H, Shimozaki N, Murayama Y*, Yokoyama T, Mohri S: Sc237 hamster PrPSc and Sc237-derived mouse PrPSc generated by interspecies in vitro amplification exhibit distinct pathological and biochemical properties in tga20 transgenic mice. Microbiol Immunol, 55(5):331-340. ●Imamura M, Kato N, Yoshioka M, Okada H, Iwamaru Y, Shimizu Y, Mohri S, Yokoyama T, Murayama Y*: Glycosylphosphatidylinositol anchor-dependent stimulation pathway required for generation of baculovirus-derived recombinant scrapie prion protein. J Virol, 85(6):2582-2588. ●Ishibashi D, Yamanaka H, Mori T, Yamaguchi N, Yamaguchi Y, Nishida N, Sakaguchi S*: Antigenic mimicry-mediated anti-prion effects induced by bacterial enzyme succinylarginine dihydrolase in mice. Vaccine, 29(50):9321-9328. ●Takakura I, Miyazawa K, Kanaya T, Itani W, Watanabe K, Ohwada S, Watanabe H, Hondo T, Rose MT, Mori T, Sakaguchi S, Nishida N, Katamine S, Yamaguchi T, Aso H*: Orally administered prion protein is incorporated by M cells and spreads into lymphoid tissues with macrophages in prion protein knockout mice. Am J Pathol, 179(3):1301-1309. ●Fujita K, Yamaguchi Y, Mori T, Muramatsu N, Miyamoto T, Yano M, Miyata H, Ootsuyama A, Sawada M, Matsuda H, Kaji R, Sakaguchi S*: Effects of a brain-engraftable microglial cell line expressing anti-prion scFv antibodies on survival times of mice infected with scrapie prions. Cell Mol Neurobiol, 31(7):999-1008. ●Watanabe K, Takatsuki H, Sonoda M, Tamura S, Murakami N, Kobayashi N*: Anti-influenza viral effects of novel nuclear export inhibitors from Valerianae Radix and Alpinia galanga. Drug Discov Ther, 5(1):26-31. ●新竜一郎, 佐藤克也：プリオン病の髄液診断の可能性, 鈴木則宏, 祖父江元 他 (編)，Annual Review神経, 中外医学社，pp.121-129. ●Atarashi R*, Sano K, Satoh K, Nishida N: Real-time quaking-induced conversion: a highly sensitive assay for prion detection. Prion, 5(3):150-153. ●Wilham JM, Orru CD, Bessen RA, Atarashi R, Sano K, Race B, Meade-White KD, Taubner LM, Timmes A, Caughey B*: Rapid end-point quantitation of prion seeding activity with sensitivity comparable to bioassays. PLoS Pathog, 6(12):e1001217. ●Kim JI, Cali I, Surewicz K, Kong Q, Raymond GJ, Atarashi R, Race B, Qing L, Gambetti P, Caughey B, Surewicz WK*: Mammalian prions generated from bacterially expressed prion protein in the absence of any mammalian cofactors. J Biol Chem, 285(19):14083-14087. ●Yokoyama T*, Masujin K, Schmerr MJ, Shu Y, Okada H, Iwamaru Y, Imamura M, Matsuura Y, Murayama Y, Mohri S: Intraspecies prion transmission results in selection of sheep scrapie strains. PLoS One, 5(11):e15450. ●Murayama Y*, Yoshioka M, Masujin K, Okada H, Iwamaru Y, Imamura M, Matsuura Y, Fukuda S, Onoe S, Yokoyama T, Mohri S: Sulfated dextrans enhance in vitro amplification of bovine spongiform encephalopathy PrP(Sc) and enable ultrasensitive detection of bovine PrP(Sc). PLoS One, Oct 4;5(10). pii:e13152. ●Okada H*, Iwamaru Y, Imamura M, Masujin K, Yokoyama T, Mohri S: Immunohistochemical detection of disease-associated prion protein in the intestine of cattle naturally affected with bovine spongiform encephalopathy by using an alkaline-based chemical antigen retrieval method. J Vet Med Sci, 72(11):1423-1429. ●Iwamaru Y, Imamura M, Matsuura Y, Masujin K, Shimizu Y, Shu Y, Kurachi M, Kasai K, Murayama Y, Fukuda S, Onoe S, Hagiwara K, Yamakawa Y, Sata T, Mohri S, Okada H, Yokoyama T*: Accumulation of L-type bovine prions in peripheral nerve tissues. Emerg Infect Dis,16(7):1151-1154. ●Ushiki-Kaku Y, Endo R, Iwamaru Y, Shimizu Y, Imamura M, Masujin K, Yamamoto T, Hattori S, Itohara S, Irie S, Yokoyama T*: Tracing conformational transition of abnormal prion proteins during interspecies transmission by using novel antibodies. J Biol Chem, 285(16):11931-11936. 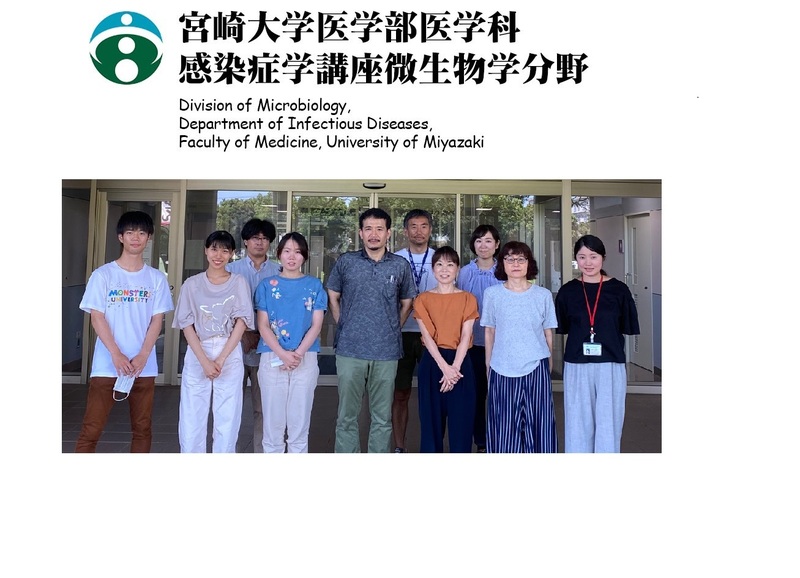 ●Takatsuki H, Taguchi F, Nomura R, Kashiwazaki H, Watanabe M, Ikehara Y, Watanabe R*: Cytopathy of an infiltrating monocyte lineage during the early phase of infection with murinecoronavirus in the brain. Neuropathology, 30(4):361-371. ●森剛志, 坂口末廣*：シナプスの病態　プリオン病. Clinical Neuroscience 別冊, 28(8): 906-908. ●Smirnovas V, Kim JI, Lu X, Atarashi R, Caughey B, Surewicz WK*: Distinct structures of scrapie prion protein (PrPSc)-seeded versus spontaneous recombinant prion protein fibrils revealed by hydrogen/deuterium exchange. J Biol Chem, 284(36):24233-24234. ●Fujihara A, Atarashi R*, Fuse T, Ubagai K, Nakagaki T, Yamaguchi N, Ishibashi D, Katamine S, Nishida N: Hyperefficient PrPSc amplification of mouse-adapted BSE and scrapie strain by protein misfolding cyclic amplification technique. FEBS J, 276(10):2841-2848. ●Fukuda S, Iwamaru Y, Imamura M, Masujin K, Shimizu Y, Matsuura Y, Shu Y, Kurachi M, Kasai K, Murayama Y, Onoe S, Hagiwara K, Sata T, Mohri S, Yokoyama T, Okada H*: Intraspecies transmission of L-type-like bovine spongiform encephalopathy detected in Japan. Microbiol Immunol, 53(12):704-707. ●Masujin K, Shu Y, Okada H, Matsuura Y, Iwamaru Y, Imamura M, Mohri S, Yokoyama T*: Isolation of two distinct prion strains from a scrapie-affected sheep. Arch Virol, 154(12):1929-1932. ●Imamura M, Wada S, Ueda K, Saito A, Koizumi N, Iwahana H, Sato R*: Multipeptide precursor structure of acaloleptin A isoforms, antibacterial peptides from the Udo longicorn beetle, Acalolepta luxuriosa. Dev Comp Immunol, 33(10):1120-1127. ●Yokoyama T*, Masujin K, Iwamaru Y, Imamura M, Mohri S: Alteration of the biological and biochemical characteristics of bovine spongiform encephalopathy prions during interspecies transmission in transgenic mice models. J Gen Virol, 90(Pt 1):261-268. ●Atarashi R*: Recent advances in cell-free PrPSc amplification technique. Protein Pept Lett, 16(3):256-259. ●Atarashi R, Wilham JM, Christensen L, Hughson AG, Moore RA, Johnson LM, Onwubiko HA, Priola SA, Caughey B*: Simplified ultrasensitive prion detection by recombinant PrP conversion with shaking. Nat Methods, 5(3):211-212. ●Masujin K, Shu Y, Yamakawa Y, Hagiwara K, Sata T, Matsuura Y, Iwamaru Y, Imamura M, Okada H, Mohri S, Yokoyama T*: Biological and biochemical characterization of L-type-like bovine spongiform encephalopathy (BSE) detected in Japanese black beef cattle. Prion, 2(3):123-128. ●Uchino K, Sezutsu H, Imamura M, Kobayashi I, Tatematsu K, Iizuka T, Yonemura N, Mita K, Tamura T*: Construction of a piggyBac-based enhancer trap system for the analysis of gene function in silkworm Bombyx mori. Insect Biochem Mol Biol, 38(12):1165-1173. ●Iwamaru Y, Shimizu Y, Imamura M, Murayama Y, Endo R, Tagawa Y, Ushiki-Kaku Y, Takenouchi T, Kitani H, Mohri S, Yokoyama T, Okada H*: Lactoferrin induces cell surface retention of prion protein and inhibits prion accumulation. J Neurochem, 107(3):636-646. ●Yoshikawa D, Yamaguchi N, Ishibashi D, Yamanaka H, Okimura N, Yamaguchi Y, Mori T, Miyata H, Shigematsu K, Katamine S, Sakaguchi S*: Dominant-negative effects of the N-terminal half of prion protein on neurotoxicity of prion protein-like protein/doppel in mice. J Biol Chem, 283(35):24202-24211. ●山口尚宏, 布施隆行, 石橋大輔, 新竜一郎, 西田教行：ヒトのプリオン病の病態. 最新医学, 63:565-584. ●Atarashi R, Moore RA, Sim VL, Hughson AG, Dorward DW, Onwubiko HA, Priola SA, Caughey B*: Ultrasensitive detection of scrapie prion protein using seeded conversion of recombinant prion protein. Nat Methods, 4(8):645-650. ●Masujin K, Shimada K, Kimura KM, Imamura M, Yoshida A, Iwamaru Y, Mohri S, Yokoyama T*: Applicability of current bovine spongiform encephalopathy (BSE) diagnostic procedures for chronic wasting disease (CWD). Microbiol Immunol, 51(10):1039-1043. ●Takenouchi T, Iwamaru Y, Imamura M, Kato N, Sugama S, Fujita M, Hashimoto M, Sato M, Okada H, Yokoyama T, Mohri S, Kitani H*: Prion infection correlates with hypersensitivity of P2X7 nucleotide receptor in a mouse microglial cell line. FEBS Lett, 581(16):3019-3026. ●Murayama Y*, Yoshioka M, Yokoyama T, Iwamaru Y, Imamura M, Masujin K, Yoshiba S, Mohri S: Efficient in vitro amplification of a mouse-adapted scrapie prion protein. Neurosci Lett, 413(3):270-273. ●Iwamaru Y, Takenouchi T, Ogihara K, Hoshino M, Takata M, Imamura M, Tagawa Y, Hayashi-Kato H, Ushiki-Kaku Y, Shimizu Y, Okada H, Shinagawa M, Kitani H*, Yokoyama T: Microglial cell line established from prion protein-overexpressing mice is susceptible to various murine prion strains. J Virol, 81(3):1524-1527. ●Mori T, Moriuchi R*, Okazaki E, Yamada K, Katamine S: Tgat oncoprotein functions as a inhibitor of RECK by association of the unique C-terminal region. Biochem Biophys Res Commun, 355(4):937-943. ●Yamada K, Moriuchi R*, Mori T, Okazaki E, Kohno T, Nagayasu T, Matsuyama T, Katamine S: Tgat, a Rho-specific guanine nucleotide exchange factor, activates NF-kappaB via physical association with IkappaB kinase complexes. Biochem Biophys Res Commun, 355(1):269-274. ●Nakamura M*, Kondo H, Mori T, Komori A, Matsuyama M, Ito M, Takii Y, Koyabu M, Yokoyama T, Migita K, Daikoku M, Abiru S, Yatsuhashi H, Takezaki E, Masaki N, Sugi K, Honda K, Adachi H, Nishi H, Watanabe Y, Nakamura Y, Shimada M, Komatsu T, Saito A, Saoshiro T, Harada H, Sodeyama T, Hayashi S, Masumoto A, Sando T, Yamamoto T, Sakai H, Kobayashi M, Muro T, Koga M, Shums Z, Norman G L, Ishibashi H: Anti-gp210 and anti-centromere antibodies are different risk factors for the progression of primary biliary cirrhosis. Hepatology, 45(1):118-127. ●新竜一郎, 片峰茂：プリオン病　特集新興・再興感染症の現状と予防. 保健の科学, 49(10):679-683. ●Imamura M, Nakahara Y, Kanda T, Tamura T, Taniai K*: A transgenic silkworm expressing the immune-inducible cecropin B-GFP reporter gene. Insect Biochem Mol Biol, 36(5):429-434. ●Yokoyama T, Komori A, Nakamura M*, Takii Y, Kamihira T, Shimoda S, Mori T, Fujiwara S, Koyabu M, Taniguchi K, Fujioka H, Migita K, Yatsuhashi H, Ishibashi H: Human intrahepatic biliary epithelial cells function in innate immunity by producing IL-6 and IL-8 via the TLR4-NF-kappaB and -MAPK signaling pathways. Liver Int, 26(4):467-476. ●Nakamura M*, Takii Y, Ito M, Komori A, Yokoyama T, Shimizu-Yoshida Y, Koyabu M, Matsuyama M, Mori T, Kamihira T, Daikoku M, Migita K, Yatsuhashi H, Nozaki N, Shimoda S, Ishibashi H: Increased expression of nuclear envelope gp210 antigen in small bile ducts in primary biliary cirrhosis. J Autoimmun, 26(2):138-145. ●Migita K*, Maeda Y, Abiru S, Nakamura M, Komori A, Yokoyama T, Takii Y, Mori T, Yatsuhashi H, Eguchi K, Ishibashi H: Immunosuppressant FK506 inhibits matrix metalloproteinase-9 induction in TNF-alpha-stimulated human hepatic stellate cells. Life Sci, 78(21):2510-2515. ●Shimada T, Moriuchi R*, Mori T, Yamada K, Ishimaru T, Katamine S: Identification of NADH dehydrogenase 1 alpha subcomplex 5 capable to transform murine fibroblasts and overexpressed in human cervical carcinoma cell lines. Biochem Biophys Res Commun, 339(3):852-857. ●Arima K, Nishida N, Sakaguchi S, Shigematsu K, Atarashi R, Yamaguchi N, Yoshikawa D, Yoon J, Watanabe K, Kobayashi N, Mouillet-Richard S, Lehmann S, Katamine S*: Biological and biochemical characteristics of prion strains conserved in persistently infected cell cultures. J Virol, 79(11):7104-7112. ●Saito A, Ueda K, Imamura M, Atsumi S, Tabunoki H, Miura N, Watanabe A, Kitami M, Sato R*: Purification and cDNA cloning of a cecropin from the longicorn beetle, Acalolepta luxuriosa. Comp Biochem Physiol B Biochem Mol Biol, 142(3):317-323. ●Shimada K, Hayashi HK, Ookubo Y, Iwamaru Y, Imamura M, Takata M, Schmerr MJ, Shinagawa M, Yokoyama T*: Rapid PrP(Sc) detection in lymphoid tissue and application to scrapie surveillance of fallen stock in Japan: variable PrP(Sc) accumulation in palatal tonsil in natural scrapie. Microbiol Immunol, 49(8):801-804. ●Ueda K, Saito A, Imamura M, Miura N, Atsumi S, Tabunoki H, Watanabe A, Kitami M. Sato R*: Purification and cDNA cloning of Luxuriosin, a novel antibacterial peptide with Kunitz domain from the Longicorn Beetle, Acalolepta luxuriosa. Biochim Biophys Acta, 1722(1):36-42. ●Hayashi HK, Yokoyama T*, Takata M, Iwamaru Y, Imamura M, Ushiki YK, Shinagawa M: The N-terminal cleavage site of PrPSc from BSE differs from that of PrPSc from scrapie. Biochem Biophys Res Commun, 328(4):1024-1027. ●Inoue S, Kanda T, Imamura M, Quan GX, Kojima K, Tanaka H, Tomita M, Hino R, Yoshizato K, Mizuno S, Tamura T*: A fibroin secretion-deficient silkworm mutant, Nd-sD, provides an efficient system for producing recombinant proteins. Insect Biochem Mol Biol, 35(1):51-59. ●Inoue S, Tanaka K, Tanaka H, Ohtomo K, Kanda T, Imamura M, Quan GX, Kojima K, Yamashita T, Nakajima T, Taira H, Tamura T, Mizuno S*: Assembly of the silk fibroin elementary unit in endoplasmic reticulum and a role of L-chain for protection of alpha1,2-mannose residues in N-linked oligosaccharide chains of fibrohexamerin/P25. Eur J Biochem, 271(2):356-366. ●Saito A, Ueda K, Imamura M, Miura N, Atsumi S, Tabunoki H, Sato R*: Purification and cDNA cloning of a novel antibacterial peptide with a cysteine-stabilized alphabeta motif from the longicorn beetle, Acalolepta luxuriosa. Dev Comp Immunol, 28(1):1-7. ●Yoshizuka N, Moriuchi R*, Mori T, Yamada K, Hasegawa S, Maeda T, Shimada T, Yamada Y, Kamihira S, Tomonaga M, Katamine S: An alternative transcript derived from the trio locus encodes a guanosine nucleotide exchange factor with mouse cell-transforming potential. J Biol Chem, 279(42):43998-44004. ●Horie N*, Mori T, Asada H, Ishikawa A, Johnston PG, Takeishi K: Implication of CDK inhibitors p21 and p27 in the differentiation of HL-60 cells. Biol Pharm Bull, 27(7):992-997. ●新竜一郎, 片峰茂：第３節感染・免疫　第１項プリオン病. モデル動物の作成と維持, 森脇和郎，山村研一他 (編)，エル・アイ・シー，pp.659-663. ●Atarashi R, Nishida N, Shigematsu K, Goto S, Kondo T, Sakaguchi S, Katamine S*: Deletion of N-terminal residues 23-88 from prion protein (PrP) abrogates the potential to rescue PrP-deficient mice from PrP-like protein/doppel-induced neurodegeneration. J Biol Chem, 278(31):28944-28949. ●Imamura M, Nakai J, Inoue S, Quan GX, Kanda T, Tamura T*: Targeted gene expression using the GAL4/UAS system in the silkworm Bombyx mori. Genetics, 165(3):1329-1340. ●Imamura M, Yamakawa M*: Molecular cloning and expression of a Toll receptor gene homologue from the silkworm, Bombyx mori. Biochim Biophys Acta, 1576(3):246-254. ●Imamura M, Yang J, Yamakawa M*: cDNA cloning, characterization and gene expression of nitric oxide synthase from the silkworm, Bombyx mori. Insect Mol Biol, 11:257-265. ●新竜一郎, 片峰茂：プリオン蛋白代謝におけるプロテアソームの役割. MEDICAL BRIEFS IN Virus Infection, 15(3):4-5. ●Atarashi R, Sakaguchi S, Shigematsu K, Arima K, Okimura N, Yamaguchi N, Li A, Kopacek J, Katamine S*: Abnormal activation of glial cells in the brains of prion protein-deficient mice ectopically expressing prion protein-like protein, PrPLP/Dpl. Mol Med, 7(12):803-809. ●新竜一郎, 片峰茂：伝達性プリオン病と遺伝性プリオン病には共通の神経変性経路が存在する. MEDICAL BRIEFS IN Brain & Nerve, 11(1):6. Copyright © 2017 - 2019 University of miyazaki All Rights Reserved.